FRANKFORT, Ky. (Jan. 30, 2019) —With Valentine’s Day approaching, Rebecca Ruth Chocolates is celebrating its 100th anniversary in business. For most of the past century, the Kentucky Proud family business has been a fixture in downtown Frankfort. Third-generation owner Charles Booe, the grandson of co-founder Ruth Hanly Booe, called Valentine’s Day “a really strong holiday” for sales of Rebecca Ruth Chocolates, many in heart-shaped boxes, but, he said, “Christmas is still the biggest holiday. Charles estimates that Rebecca Ruth produces about 5 million pieces of candy per year. Rebecca Ruth’s 36 employees still make the candy mostly by hand and ship it all over the country. Locally, it’s sold behind a counter in the front of the factory at 116 E. Second St. and at its own candy store at 3295 Versailles Road just southeast of Interstate 64. Charles said Rebecca Ruth’s longtime membership in Kentucky Proud has “been important” to his business. Rebecca Ruth is not a woman’s name, but rather a combination of two first names. Substitute schoolteachers Rebecca Gooch and Ruth Hanly Booe founded the company in 1919. Rebecca sold her half of the business to Ruth in 1929. 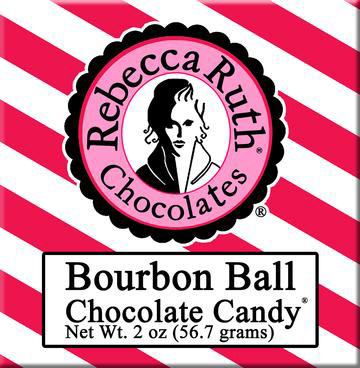 Ruth worked for two years perfecting the still-secret process of blending Kentucky bourbon and chocolate candy. Bourbon balls, made with Evan Williams bourbon and topped with a pecan, are Rebecca Ruth’s best-selling candy. “She produced the single best taste in the world,” Charles said proudly. Ruth’s candies were so popular that, when sugar rationing during World War II put a stop to production, some of Ruth’s customers saved up their own sugar rations so she could make them chocolate candy. Ruth made candy for 45 years. As word spread from Washington, D.C., to Hollywood, her customers included former President and First Lady Harry S and Bess Truman, and celebrities Fred Astaire, Joe E. Brown, Irene Dunne, and Frank Sinatra. In 1964, Ruth called her only son, John, in New York and asked him to come home and take the reins of the family business. John dutifully quit his job as an accountant for DuPont and returned to Frankfort to fulfill the wishes of his mother, who died in 1973. During John’s 33 years at the helm, he introduced the first computer into the office. He also broadened the line of liquor chocolates to include rum, scotch, and cognac. Charles bought the business from his dad in 1997. Like his father, Charles has added a variety of chocolate flavors, such as mint julep; expanded the bourbon line to include cherries, toffee, caramels, and brittle; and introduced new ingredients to create hemp and chia bark. To order Rebecca Ruth products, or for information about tours of the Second Street plant, go to rebeccaruthonline.com. To find other Kentucky Proud chocolatiers and confectioners, go to kyproud.com.